Looking through a pile of magazines recently, I found a 2011 newspaper article I had cut out about Hardwick, Vermont. It’s about reinventing the local culture around food and food-related businesses. Dirk Van Susteren wrote at the Boston Globe, “If there were a ‘Locavore Capital of America’ one would expect it to be in sunny California or perhaps somewhere in the heartland … But, surprisingly, in rocky northern New England, just 45 miles from the Canadian border, is a place that could contend for that honor: Hardwick, a former quarrying town that until recently knew more pain than promise. “The town, always a bit scruffy, and with a high jobless rate, might be on a green trajectory. And people are taking notice. “Among the new operations here or in nearby towns: Jasper Hill Farm, which makes artisanal cheeses and provides aging, distribution, and marketing services to local cheesemakers; High Mowing Seed Co., an organic seed business, whose owner likes traveling around the country to tell the Hardwick farm and food story; Highfields Center for Composting, a soil-making business that collects its raw materials from restaurants, farms, and schools; Pete’s Greens, a CSA (community-support ed agriculture) farm that grows organic vegetables in gardens and greenhouses; and, finally, Vermont Soy, a tofu and soymilk producer. 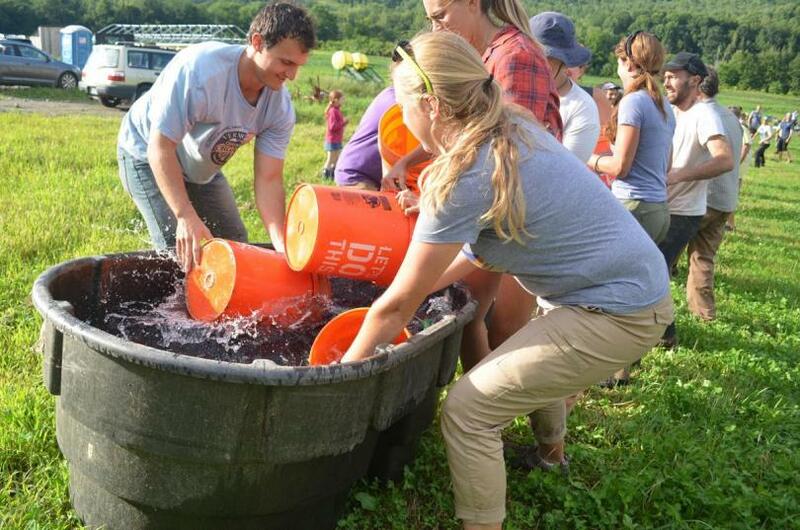 Read about the 2011 federal grant for the Vermont Food Venture Center, an incubator facility, the organic North Hardwick Dairy, where sunflowers are grown as a value-added crop, mead maker Caledonia Spirits, and more here. And if anyone has been up there recently, I sure would love to know if the food culture is still going strong. The radio show Living on Earth is a font of useful and interesting environmental knowledge. Forcella then tells Curwood how he got the idea. “One of my hobbies here in Minnesota is growing apricots, and 2007 happened to be a wonderful year for apricot production in Minnesota. Read how a dumb idea led to a great invention here. 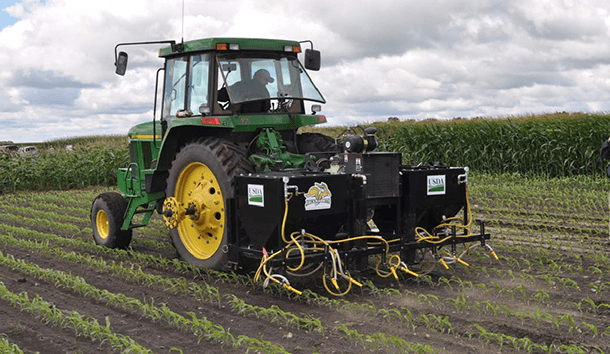 The four-row grit applicator in action, driven by Charles Hennen. The photographer writes, “We were recently contacted by Chronogram Magazine, a tremendous monthly publication circulated in and around the Hudson Valley based out of Kingston, NY. They asked that we photograph some young farmers local to the Hudson area for an article being written for their September issue. … It was a true honor to be considered for this assignment, especially after meeting these amazing people who UNDERSTAND what it means to eat responsibly. Letterbox farmer Nichki’s Aunt Sandra sent me a photo of a spring farmers market that the collective attended in Rhinebeck. I’m told they can hardly keep up with the demand from restaurants for duck eggs, rabbits, and quail. The Globe has a good story today on Whole Foods, which hired an urban farming company to grow an anticipated 10,000 pounds of food per year on the roof of its Lynnfield, Massachusetts, store. “Whole Foods and its contractors say the commercial roof garden is an experiment that, if it succeeds, could encourage other grocers to do the same, boosting efforts to expand rooftop gardening. Such gardens not only insulate buildings, lowering heating and cooling costs, but also decrease storm-water runoff, which can overwhelm sewer systems and carry pollutants into waterways. “And they yield fruits and vegetables that do not need to be trucked or flown, cutting transportation costs and emissions, including of greenhouse gases. The rooftop produce — a tiny fraction of Whole Foods’ inventory — will be sold in the Lynnfield store or used in its prepared foods. “Whole Foods’ plans quickly became more ambitious as company officials realized the 45,000-square-foot roof (nearly an acre) provided plenty of space for farming.” More. There’s also a fun video at the Globe site showing the construction of the roof farm. Suzanne’s Mom’s Blog had another roof garden post here; a post about Glide Memorial’s roof garden here; and a related entry about the Guardian Environment Network, here. 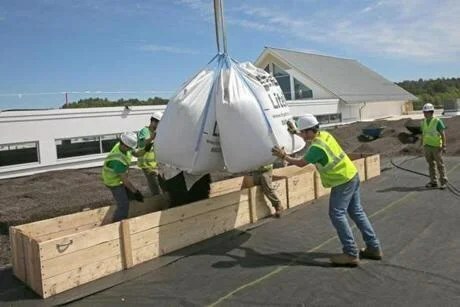 Workers dumped soil into containers on the Lynnfield Whole Foods roof, which was reinforced to bear the extra weight. This post’s for my daughter-in-law, who not only loves to cook but is also pretty savvy about healthful eating. I should know. I had a yummy something with orzo and mushrooms for Tofu Tuesday at my son’s house last night. Today’s story from the NY Times is on the expanded distribution goals of a company with inventive food options currently popular with celebrities. And, as Stephanie Strom writes, the offerings are not just for vegans. 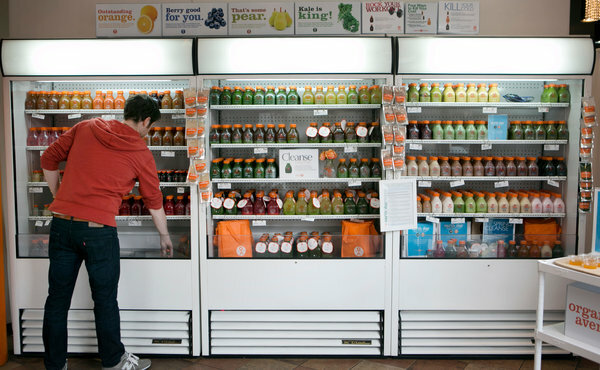 “Organic Avenue, the tiny purveyor of high-end juices, fresh salads and specialty foods like cashew scallion cream cheese and Thai collard wraps, has hired a new chief executive with the goal of turning its new owner’s dreams of a national chain into reality. Bates, who turned around the Pret a Manger chain, said that he is up for the challenge. “Perhaps tellingly, he said his favorite Organic Avenue product was Dragon’s Breath, a juice that incorporates ginger, lemon and cayenne pepper. ‘Caution,’ the company’s Web site warns. ‘This shot is not for the faint at heart!’ ” More. We are into dragons around here. I’ll have to see if I am brave enough to drink Dragon’s Breath.